Celebrated on the Tuesday following Thanksgiving (in the U.S.) and the widely recognized shopping events Black Friday and Cyber Monday, #GivingTuesday kicks off the charitable season. You are invited to celebrate Giving Tuesday with ASA this year. If you are unable to attend our Giving Tuesday event in person, we hope you will help us celebrate with a contribution to ASA. This year, ASA is campaigning to raise funds for our unrestricted funds, primarily our emergency fund. ASA's emergency fund enables us to act swiftly to provide financial support in the wake of tragic events. The Emergency Fund is also intended to be used towards providing funds for emergency shelter, other basic needs, educational support for dependent children, or supplement initial living expenses - including food and basic needs. 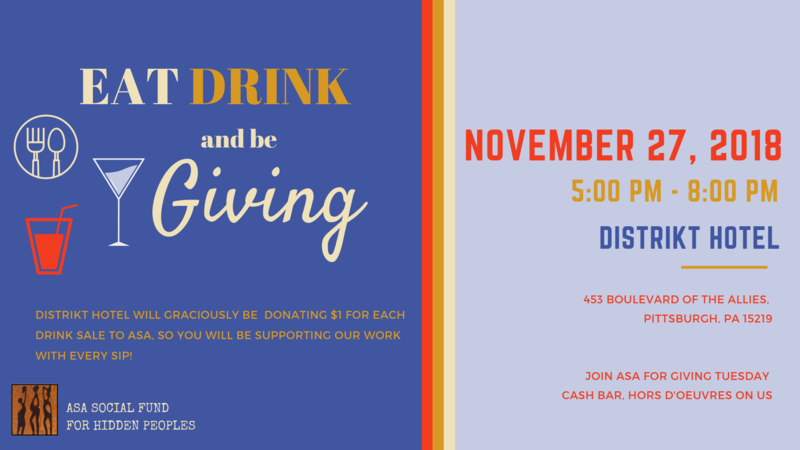 Join ASA for a happy hour to celebrate Giving Tuesday. A gift of $50 can help provide school supplies needed for a student to attend one semester of schooling. A $100 donation can provide one months worth of food and medicines for individuals in need or those who are fleeing dangerous or violent situations. A $250 donation will provide funds to provide an emergency kit for individuals or children in order to provide immediate needs. Donations of any amount can go a long way in supporting ASA's various programs. Your generosity will provide much needed support for all hidden peoples. Copyright © 2018 ASA Social Fund, All rights reserved.